Computational Earth Materials: Atomistic simulations of earth materials and processes using high-performance computers. J.W. Wang (2015) Incorporation of iodine into apatite structure: a crystal chemistry approach using Artificial Neural Network. Frontiers in Earth Science, 03, 20. doi: 10.3389/feart.2015.00020. J.W. Wang, R. C. Ewing, and U. Becker (2014) Average structure and local configuration of excess oxygen in UO2+x. Scientific Reports, 04, 216. DOI:10.1038/srep04216. (A video showing oxygen diffusion in UO2+x lattice: uo2+x-diffusion.mpg, 11 seconds, 2MB). 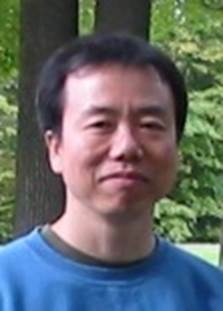 H. Lu, J. W. Wang, C. Liu, C.I. Ratcliffe, and J.A. Ripmeester, (2012) Multiple H2 occupancy of the cages in hydrogen hydrate under mild condition. Journal of the American Chemical Society, 134, 9160-9162. DOI: 10.1021/ja303222u. I. Sethmann, J.W. Wang, U. Becker, A. Putnis (2010) Strain-Induced Segmentation of Magnesian Calcite Thin Films Growing on a Calcite Substrate. Crystal Growth & Design, 10, 4319 - 4326. DOI: 10.1021/cg100202h. J.W. Wang, M. Lang, R.C. Ewing, and U. Becker (2013) Multi-scale simulation of structural heterogeneity of swift-heavy ion tracks in complex oxides. Journal of Physics: Condensed Matter, 25, 135001. DOI: 10.1088/0953-8984/25/13/135001. (A video showing annealing of the track: pyrochlore-track.gif, 9 seconds, 66 MB). J. Wang, A.G. Kalinichev, and R.J. Kirkpatrick (2009) Asymmetric hydrogen bonding and orientational ordering of water at hydrophobic and hydrophilic surfaces: a comparison of water/vapor, water/talc, and water/mica interfaces. Journal of Physical Chemistry C, 113, 11077 - 11085. DOI: 10.1021/jp9018316. (A video showing Al-13, Al-30 clusters: keggin-mov.mpg, 16 seconds, 1.6 MB; al30-mov.mpg, 8 seconds, 1.8 MB).